Connect with your clients one day at a time. If you have ever used Woot.com, or Groupon, or something similar, you know what Daily Deals can do for your business! Set up Daily Deals that will be sent to your most loyal clients - the ones who indicate they'd love to hear from you - reminding them to come by for your recurring specials or even make a gift purchase online without ever leaving their desk. If you wish, your clients can see your Daily Deals page right from your website, giving them even more reason to come back day after day for goodies. 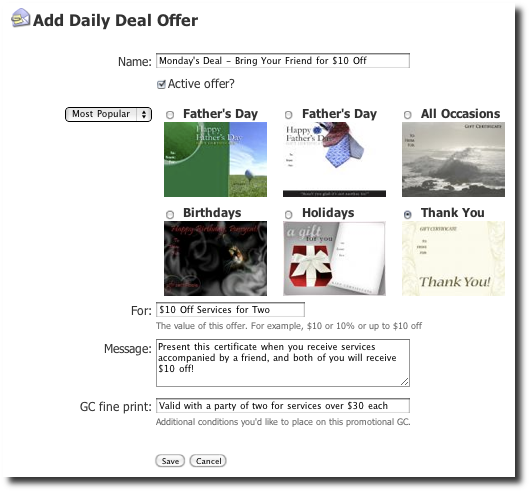 From your Marketing Tab, find the section titled "Daily Deal" and click "turn on" to get started. From the drop-down Offer, choose Create New Offer - we'd like you to put your own stamp on Daily Deals so creating your own is the best way to begin. Create an Offer of any kind you'd like, with all the details you desire - in the example below it is called the Monday Deal and is for $10 off per person in a party of two. Make sure you also pick the IGC design you'd like used for this Daily Deal - it is what your clients will receive when they take you up on the promotion! Save your Offer and choose the Expiration from your Edit Daily Deals list - up to three days in the future from the Deal's issue date. Finally, choose the limit of how many offers to issue - if you would only like to give out 5, or 2, or 100 - just type in your number. Scroll down on the page and make sure you click "Save" to apply your Daily Deal settings. You can then promote the Daily Deal even more by saying "only the first X clients to respond will get our special offer!" You can send deals on every single day, or you can skip days - it is up to you. Once you get rolling, you might find that going directly into the Offers page to add all the Offers you plan to use for Daily Deals is a handy strategy. Then once your Daily Deals all show up on your Offers List, go back into your Daily Deals date list and pick all the ones you plan to send. Perfect! Oops, in our example above, we picked a Monday Deal for a Wednesday - let's get that fixed by changing the name of the Offer. 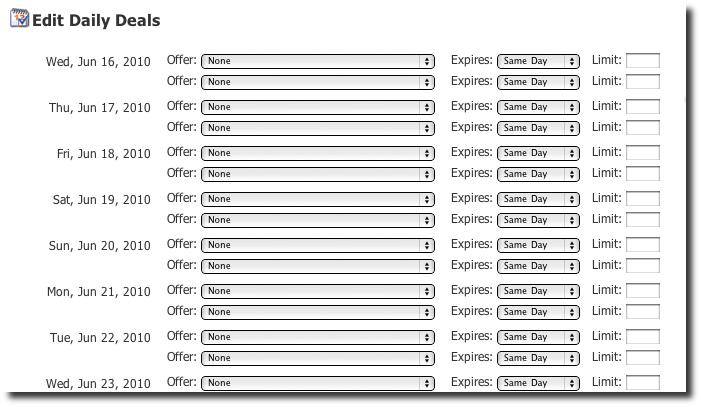 From your Marketing Tab, click Offers on the left-hand column to see your full Offers list - Daily Deals, Specials, Referral Codes, everything! Find the Daily Deal we need to correct, choose it from the list, and make your edits. Make sure you click Save when you're done, and you'll be back to the Offers list. Click on Daily Deals on the left to go back to your Daily Deals list, and your offer should now look much better. Decided not to send a future Deal? Just go into your Daily Deals list from the Marketing Tab and find the Deal you'd like to cancel - if it has not gone out yet - and simply change the Offer selector to "None", then click Update or Save at the bottom of the page. Any Deals that have already gone out will still be valid, so make sure your staff knows to expect Daily Deal holders to come through your doors! Open your Offers list, from the sidebar of your Marketing Tab. Locate the Daily Deal Offers that are marked as "Active". Open up each offer as needed and uncheck the box that says, "Active Offer?". Repeat for any types of Offers you want to disable. There are TWO ways to get your Daily Deals in front of your clients. Second - link to your Daily Deals page on your website! A page is created for you when you turn Daily Deals on, which you can see in your Dynamic pages list (called "dailydeal"), or in your Integrated pages list. The layout of the page might look strange, but it is pulling all kinds of information for your clients. Advertise your Daily Deals page with posters in your business, flyers at the front desk, anything you'd like. On that Daily Deals page one or two Deals will be shown and your clients can choose which one to receive, just by entering their email address. Don't worry if they are already in your client database - their information will just be updated, not duplicated. If you find that some clients unsubscribe, don't worry - just keep signing them up at your front desk and you'll make sure that you are reaching your MOST interested customers - the ones that will be making many purchases and influencing their friends and family to do so, as well. Win win! © 2004-2019 Sevence, LLC, all rights reserved.